Liverpool manager Rafael Benitez has confirmed goalkeeper Scott Carson will be part of the first-team squad at Anfield next season. Carson, 21, was a part of the England Under-21 squad for the European Championship and spent last season on loan at Charlton, who were relegated. But Benitez said: "I spoke to Scott recently and I told him he will be part of our first-team squad next season. "He must fight with Pepe Reina now for a starting place." Benitez added: "We knew when we fought off Chelsea to sign him he was a talented goalkeeper. Carson has been linked with a move to Aston Villa, with Fulham also keen on taking the former Leeds stopper to Craven Cottage. He produced some fine displays as England U21s reached the semi-finals in Holland, only to lose to the hosts on penalties on Wednesday. Carson joined Liverpool after just two starts for Leeds in January 2005, for a fee of £750,000. He played nine games on loan for Sheffield Wednesday in 2006 before joining Charlton last August and appearing 38 times for the Addicks. He performed heroically as they fought relegation, but they eventually finished four points adrift of safety. 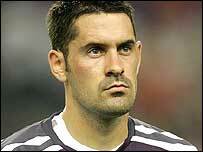 Carson was also a part of England's World Cup squad in 2006, though he is yet to represent his country.